This '60s Style design was inspired by the colours and patterns featured on clothing, wallpapers and home decor of the period. Shades of blue, orange and khaki have been used through this design along with swirling shapes and sweeping petals. 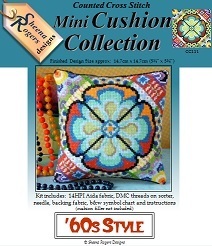 Only whole cross stitch is required throughout this design, so no fractionals or backstitch are needed.